Brexit and weak economic performance will slow growth in legacy income for UK charities over the next few years, according to the latest report from the charity legacy consortium Legacy Foresight. In its 2017 Legacy Giving report, which was released today, Legacy Foresight says it expects that growth in legacy income will be 2.7 per cent a year over the next few years, or just 1 per cent when inflation is factored in, reaching £3.3bn in 2021. But this figure also accounts for an expected rise in the death rate, with residual bequest values expected to rise by 1.3 per cent a year, meaning that the legacy values will grow below the rate of inflation. The report says this is likely to lead to a fall in the real value of legacies for charities. In contrast, the growth rate in legacy income for charities surged by almost 30 per cent between 2012 and 2016, the equivalent of 6.5 per cent a year, according to Legacy Foresight. The report says it expects that Brexit and a stagnating housing market will affect charities’ income from legacies. "Most commentators expect the British economy to slow significantly over the next two to three years, while the finer details of the Brexit deal are thrashed out," the report says. "UK house prices will be far less buoyant than of late, and may well see small falls. Share prices are expected to perform fairly well, but with considerable volatility on a day-to-day basis. These factors will not impact on the number of bequests left, but they will dampen average residual bequest values." Legacy Foresight’s data shows that, since 1988, legacy income for charities has risen from £500,000 a year for the sector to £2.8bn in 2016, which is equivalent to 3 per cent of all the money left in estates last year. This means that, once inflation is taken into account, legacy income has grown at 3 per cent a year on average since Legacy Foresight began collecting its data in 1988. But the growth rate in the number of charitable legacies has been much slower, with an increase of 1.7 per cent per annum – from 68,000 legacies in 1988 to 119,000 in 2016, the report says. 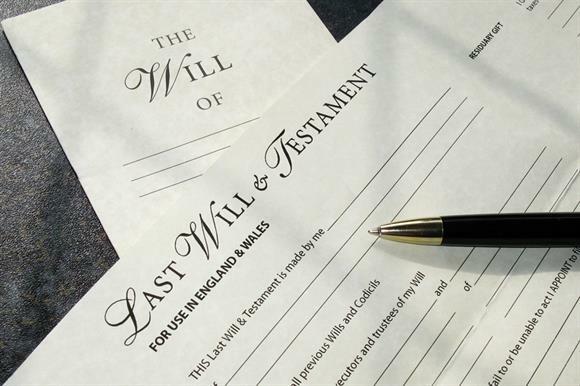 According to the report, 16 per cent of wills at probate – the process of administering a dead person’s estate – are charitable, with an average of 3.35 charitable gifts per will. To put the figure in context, there were 286,000 grants of probate issued in 2016 out of 596,000 deaths, 242,000 of which included a will. The update from Legacy Foresight says that the number of charitable bequests is likely to increase because the death rate is expected to rise in the next 20 years as the baby boomer generation reaches old age. The top 1,000 legacy charities accounted for 77 per cent of all legacy income, with 35 per cent of the top 1,000’s income going to the 10 biggest legacy-earning charities, according to Legacy Foresight. Despite this, legacy income growth rates among medium-sized charities earning between £1m and £8m in legacies a year was at 8 per cent.